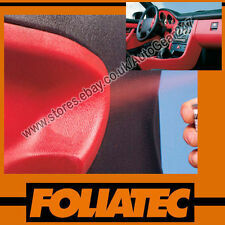 Foliatec Red Interior Colour Spray - 400ml. Interior color spray colours soft plastic and artificial leather trim - in top quality. The special chemical composition provides a deep penetration of the colour into the material, to form a permanent and elastic bond. 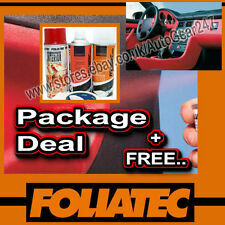 Foliatec Flat (Matt) Beige Interior Colour Spray - 400ml. Interior color spray colours soft plastic and artificial leather trim - in top quality. The special chemical composition provides a deep penetration of the colour into the material, to form a permanent and elastic bond. 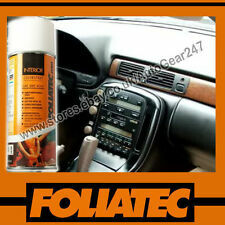 Foliatec Sealer Clear Interior Spray - 400ml. Sealer Spray for Vinyl & PVC. Clear & Transparent. In event of slight delay, your patience will be greatly appreciated. No peel or rub off. Improves adhesion of interior color spray on hard plastics. In event of slight delay, your patience will be greatly appreciated. Easy Application. 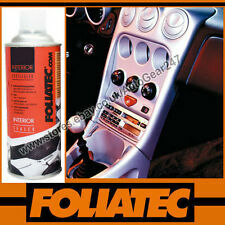 Foliatec Flat (Matt) White Interior Colour Spray - 400ml. Interior color spray colours soft plastic and artificial leather trim - in top quality. The special chemical composition provides a deep penetration of the colour into the material, to form a permanent and elastic bond. 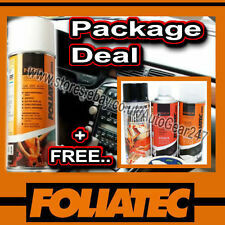 Foliatec Flat (Matt) Black Interior Colour Spray - 400ml. Interior color spray colours soft plastic and artificial leather trim - in top quality. The special chemical composition provides a deep penetration of the colour into the material, to form a permanent and elastic bond. Complete set of high quality Foliatec sports pedals. TUV APPROVED. Finished in silver brush aluminium. Helpful Links. We give a 1 year warranty on all goods unless otherwise stated - such as ex-demo item which may only have 3 or 6 month warranties. Refined look. Easy to cut to size. Universal fit for most cars with pedals suspended from above. Autobahn tested. German TUV approved. Sealer Spray for Vinyl & PVC, Clear & Transparent, No peel or rub off & Easy Application. Interior color spray colours soft plastic and artificial leather trim - in top quality. The special chemical composition provides a deep penetration of the colour into the material, to form a permanent and elastic bond. Ideal for all cars. ideal for plastics . We give a 1 year warranty on all goods unless otherwise stated - such as ex-demo item which may only have 3 or 6 month warranties. We cannot be held responsible if the product is not suitable for use outside the UK. 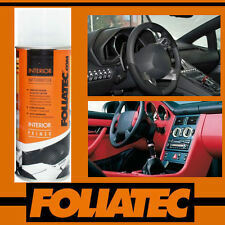 Foliatec Gloss Black Interior Colour Spray - 400ml. Interior color spray colours soft plastic and artificial leather trim - in top quality. The special chemical composition provides a deep penetration of the colour into the material, to form a permanent and elastic bond. FOLIATEC high brightness GREN LED 10mm - 33144. 10mm outer bezel size. SALE IS FOR 1 LED ONLY. Power Green. We cannot be held responsible if the product is not suitable for use outside the UK. Ideal for motorsport use. FOLIATEC high brightness RED LED 10mm - 33143. 10mm outer bezel size. SALE IS FOR 1 LED ONLY. We give a 1 year warranty on all goods unless otherwise stated - such as ex-demo item which may only have 3 or 6 month warranties. FOLIATEC high brightness BLUE LED 10mm - 33142. 10mm outer bezel size. Ice blue LED. SALE IS FOR 1 LED ONLY. We cannot be held responsible if the product is not suitable for use outside the UK. Ideal for motorsport use. Color rossorot. 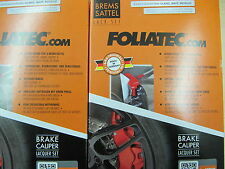 Brake Caliper Paint Set. The professional racing-style BRAKE Caliper Paint Set. The caliper paints can be mixed with each other. • Heat resistant up to 300 ° C. 150ml color - 50ml hardener - 400ml brake cleaner. Brake Caliper Paint Set. The professional racing-style BRAKE Caliper Paint Set. The caliper paints can be mixed with each other. The complete set consists of spray cleaner and a 2-component coating system. Brake Caliper Paint Set. The professional racing-style BRAKE Caliper Paint Set. The caliper paints can be mixed with each other. • Heat resistant up to 300 ° C. 150ml color - 50ml hardener - 400ml brake cleaner.